Islamabad, April 17: At least 39 people were killed and 135 injured as rain continued to wreak havoc across Pakistan, the National Disaster Management Authority said on Wednesday. At least 80 houses were damaged as torrential rain lashed Pakistan's Punjab, Balochistan and Khyber Pakhtunkhwa (KP) provinces, Geo News reported citing authorities. In the last 24 hours, the Met office recorded 57mm rain in Islamabad, 24mm rain in Rawalpindi, 43mm rain in Lahore, 40mm in Gujranwala and 16mm in Peshawar, the report said. Pakistan: 26 Killed, Dozens Injured As Rains and Dust Storm Plays Havoc. Authorities warned of more widespread dust-thunderstorms and rain accompanied by gusty winds in Punjab, Islamabad and KP. Pakistan media reports on Tuesday said that the country's Balochistan province was the worst-hit in the rains which hit earlier this week. Several incidents of roof and wall collapse were reported in many areas. 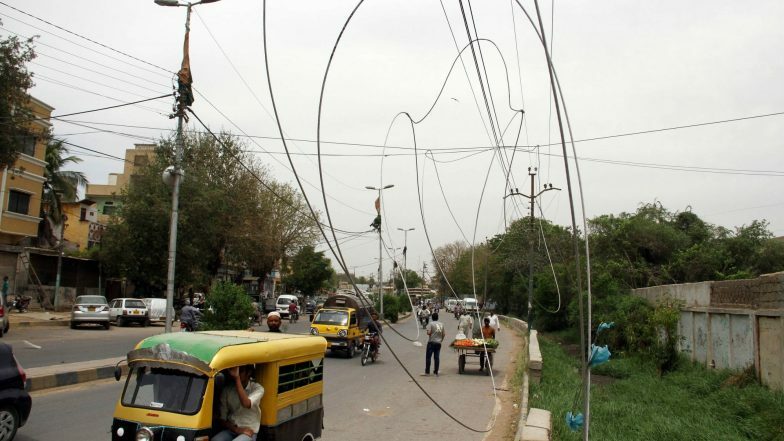 Trees and signboards were also uprooted by gusty winds in Karachi and Punjab. Several children were injured when the wall of a school collapsed in Karachi earlier this week. In a separate incident in the city, several prisoners were injured when a tree fell on a van carrying them. Karachi Storm: Pakistani City Hit by Western Disturbance Enroute North Indian States; 5 Killed, 36 Injured.